In September we examined TV ratings in Kenya over three months, and here we are presenting a more detailed analysis of Kenyan TV viewership in October. According to BuzzKenya, there are over 15 local TV stations in Kenya, but both GeoPoll’s data and information from The Kenya Advertising Research Foundation demonstrate that only a few dominate in terms of audience size. In October Citizen TV was once again the clear leader in terms of both share and viewership, with an average of 1.42 million viewers per 30-minute time block. In a distant second was KTN with 535,000 viewers per time block, and third is NTV with 442,000 viewers. 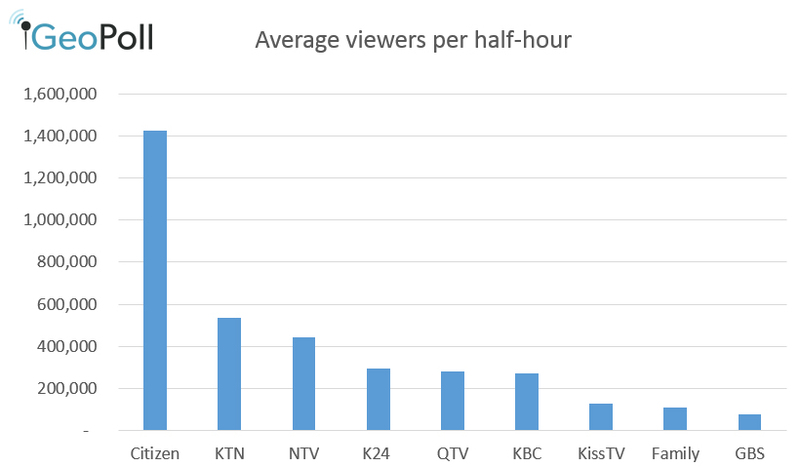 K24, QTV, and KBC are fourth, fifth, and sixth in terms of viewership, all with an average viewership of less than 300,000 per half-hour. While Citizen’s viewership stays much higher than its’ competition throughout the day, the channel does have daily peaks in audience size, most notably during the weeknight evening hours of 7pm-10pm. At 7pm during the nightly news show Citizen Nipashe and the weekend version Nipashe Wikendi, Citizen’s average viewership in October was over 2.2 million, and audience numbers stay high through the primetime schedule, never dipping below an average of 2 million viewers before 10pm. In October KTN and NTV both had their daily peaks later in the evening hours: KTN’s highest viewership was at 9pm, with an average of 930,000 viewers from 9pm-9:30pm. NTV also had it’s largest daily audience size at 9pm, with an average of 828,000 viewers. 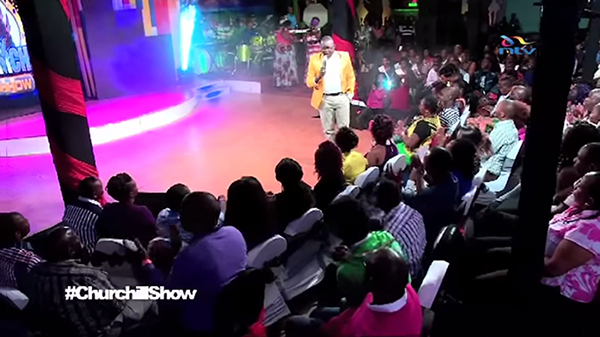 NTV’s highest audience size throughout the week consistently comes from the popular comedy and entertainment show The Churchill Show, which airs new episodes each Sunday at 8pm. In October, The Churchill Show had an average of 1.95 million viewers each Sunday, and the highest rated episode aired on October 12th. The October 12th episode, Season 4 Episode 32, featured several Miss World contestents and had an audience of over 2.25 million viewers. This data is from GeoPoll’s Audience Measurement Service, which collects daily data on TV and Radio audience sizes, share, and more. To learn more about this subscription service and sign up for real-time, detailed media measurement data click below.